The mainstream media continues to debate games as art, but what about art from games? There’s no disputing that Alison Mealey’s gallery-worthy creations are works of art, nor that they are generated using real videogame data, specifically Epic Games’ futuristic fragfest Unreal Tournament. Each portrait represents about half an hour of gameplay, during which 20-25 bots battle each other across custom made maps. These maps are designed so that the virtual players have a rough idea of where to go to create a certain image, though their deviation from the preset paths is what makes each image a surprise even to the artist herself. 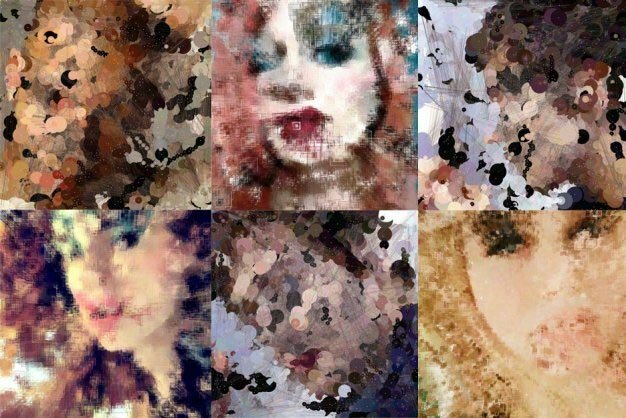 Guided by the power of suggestion and their own AI impulses, their course and even eventual death becomes, through a program that converts their journey into a printable postscript file, a smudge of lipgloss or smear of eyeshadow in a portrait whose process is every bit as fascinating as the impressionistic finished product. You can pick up a limited edition print at the artist’s website, UnrealArt, or commission your own game generated portrait.